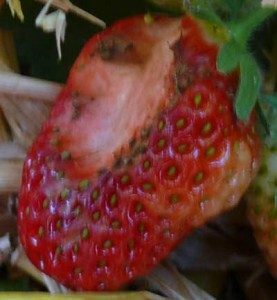 This is a bad year for slugs on strawberries. The slug population has exploded in the ideal conditions provided by the wet conditions last summer & this spring. surround the strawberry row with oyster grit, or a similar medium, which the slugs do not like to cross. place ’slug pubs’ amongst the rows. These are small containers of beer which the slugs drop in to. leave grapefruit or orange skins in the row, which will attract slugs, & pick the slugs out every day & destroy. purchase a pyramid slug trap. elevate the strawberry plants on poles which the slugs cannot climb – see table top strawberries. Click this link for more information on slug control. 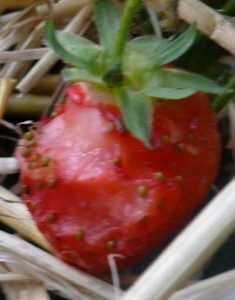 Slugs can devastate the strawberry crop, so it is worth taking time to control the slugs, using a number of different methods.